Jason S. Darnall of Benton, Kentucky has been watching the weather and helping others in the community since he was young. He grew up hanging around the local fire departments where both his father and mother were firefighters. His father, Barry, is a paramedic in Marshall County and his mother, Shaun, worked with the Red Cross in Paducah for many years. Once he was old enough, he too became a firefighter and later received his degree as an EMT. Currently, he volunteers for Harvey-Brewers, Benton City, and Palma-Briensburg Fire Departments. Jason received a degree in electronics from the Institute for Electronic Technology and works at Jackson Purchase Two-Way Radio with Motorola in Paducah, Kentucky. However, throughout his youth, a passion for weather was also brewing in his soul. Jason has been a certified weather spotter and storm chaser since his teenage years. 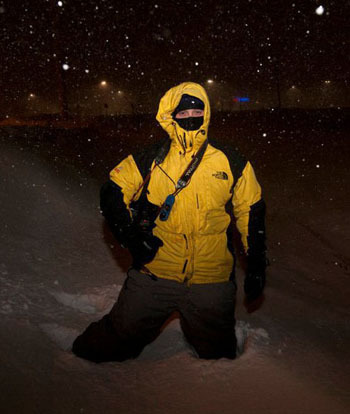 Snow and severe weather is his passion. He has formed an impressive collection of radar software and observation equipment that he uses to assist Marshall County dispatch, volunteer firefighters, storm chasers, and others in monitoring and predicting severe weather. He is currently enrolled at Penn State University and is in the process of completing his degree in meteorology.